In the digital age, luxury brands are smart to set themselves apart with a sumptuous printed corporate identity suite. 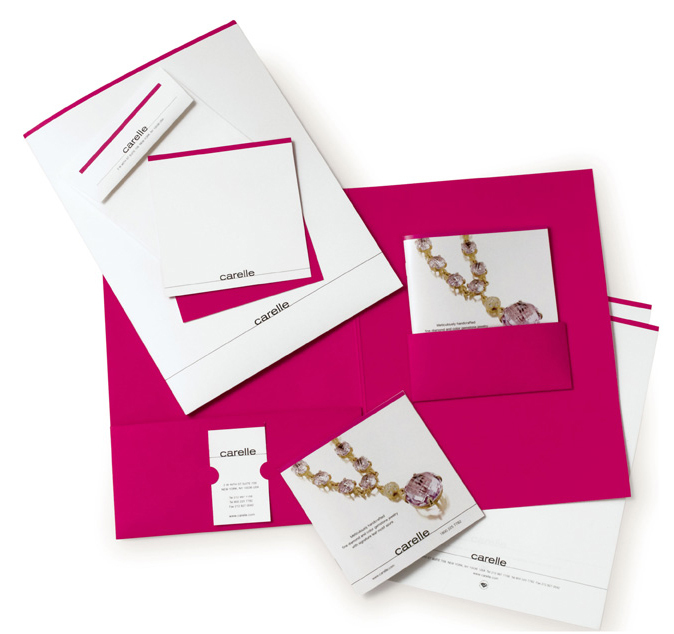 We did this one for Carelle, a jewelry brand, focused on simple, clean, beautiful, organized, color-coordinated materials that make a statement. A 5-1/4″ square, 48-page overview brochure fits perfectly into a hand-applied floating pocket. This statement-piece sits to the right where the eye goes first, rather than to the left where it would ordinarily be positioned. Coordinating stationery, business cards and letterhead share bold Pantone® Rhodamine Red as the unifying graphic detail. The folder gets full-coverage of the hot tone, on a cost-effective paper that prints beautifully and feels elegant, Finch Fine Cover. The rest of the materials were printed on Crane’s paper, still the gold-standard for corporate identity. To achieve the stripe of red that bleeds off of the top, we printed everything slightly oversized and then trimmed. The midnight-blue type is the perfect foil for the Rhodamine Red, and the jewelry pops off a bright white ground. highresolution® is very experienced at printing to achieve the sparkling purity of fine jewelry and gems, and anywhere a deft hand with color is required.